Systec's Roller Transfer Device (RTD) is a very effective method of manual load movement on and/or off a conveyor line. Based on the application, the RTD can be pneumatically actuated using either a foot-valve, or foot switch. Based upon the application, the RTD can act as a one, two, three, or four-way intersection. This is a low-maintenance device applying the most advanced designs and features. 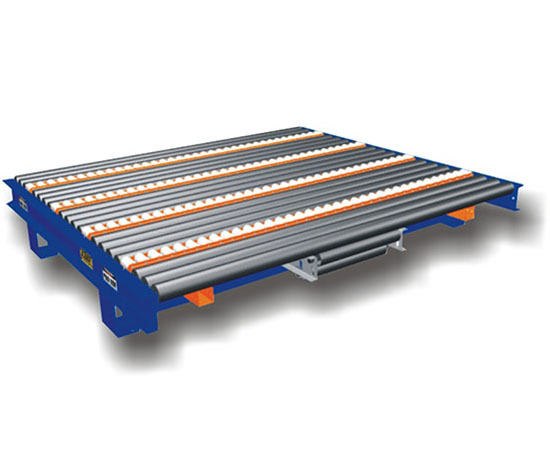 Can sit within the conveyor line at virtually any location. Can be moved, if need be, with very little effort. Totally independent of the conveyor in which it rests, and can be added to most other conveyor equipment manufacturer's lines. Capable of being added to Powered Accumulating Roller conveyor (PAR), Powered Roller Only conveyor (PRO), or Gravity Roller Conveyor (GRC). Additionally, the RTD's roller racks are fully adjustable on a 3” increment to meet any changes in load sizes or production requirements. Manual: Foot actuated pneumatic valve; Foot actuated pneumatic switch.